Kosher poutine. Surely that’s a contradiction? Those crisp golden french fries dripping with melted cheese, complimented with a rich, yet silky beef gravy. If you ask me, this is the ultimate comfort food. 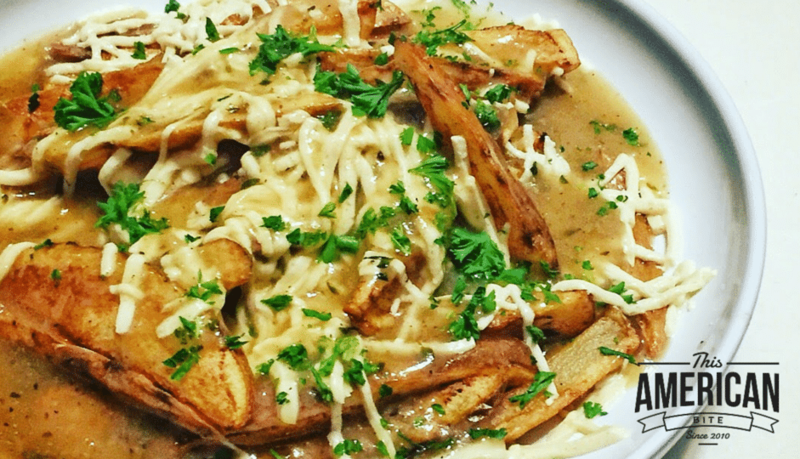 Not only is this poutine recipe kosher, it’s both dairy-free and gluten-free too. So while the fried potatoes may not be the healthiest way to indulge, at least this can become a ritual that you can share with almost anyone. And if you really want a healthier version, you could make fries in the oven, or even try making poutine with baked yucca fries, but I am going to leave those ideas alone for today. Poutine is a Candian dish hails from Quebec in the 1950s. Classically, this is street food made from french fries, cheese curds, and gravy. There are claims that poutine was inspired by the British classic of chips, cheese and gravy that is known to have been served in the North of England as early as 1901. For the kosher foodie, poutine was introduced to the kosher household when Busy in Brooklyn shared her poutine latkes in 2014. Well, two years later, I’m proud to share a kosher poutine recipe of my own. In a kosher kitchen, milk products and meat products are never combined. In our home, we made the decision to make our kitchen entirely dairy free so this recipe has an authentic rich onion gravy made on a base of homemade chicken stock. My cheese was Daiya vegan mozzarella shreds. Have I convinced you that kosher poutine can really work? It would be very easy to make a meatless gravy with vegetable stock making this a perfect treat for meatless Monday! Pro tip – add a teaspoon of marmite to your vegetable stock for deeper, richer flavors. This is a fairly traditional poutine recipe, staying true to classic hand cut British fries which are thicker than the french fries you typically get in the US. You might know these as steak fries. If you’re looking for even more excitement from your kosher poutine, consider chopped mushrooms in your gravy, or pulled bbq beef or shredded chicken in your dish.If you want to make the perfect gravy, make it the day before and let the flavors mature overnight. That’s not to say that this dish isn’t delicious if you make your gravy while you’re frying up those potatoes! One more thing, if you like the idea of make-ahead recipes, the flavor develops nicely if you make the gravy the day before and re-heat it on a low heat when it’s time to assemble the dish. That’s not to say that this dish isn’t delicious if you make your gravy while you’re frying up those potatoes! I find my lodge cast iron skillet perfect for making french fries too. It handles heat very well but be careful not to burn your hand on the handle. Seriously, this is the best $30 you’ll spend for your kitchen. Finely chop your onion and saute in a saucepan for 5 minutes. Add the garlic, crushed, then the salt, pepper and thyme and saute for another 10 minutes until golden. Add 3 tablespoons of arrowroot powder and stir for a couple of minutes until the onions are covered evenly. Add the chicken stock, making sure to scrape any onions from the bottom of the pan. Reduce the heat and let the gravy simmer for five minutes. Using a hand blender, blend the gravy until smooth. Add additional black pepper to taste. If you need to thicken the gravy a little more, add more arrowroot, one teaspoon at a time and stir slowly. Cut five large potatoes by hand to your desired thickness. Thick hand cut fries are best as these retain their crunch when assembling the poutine. 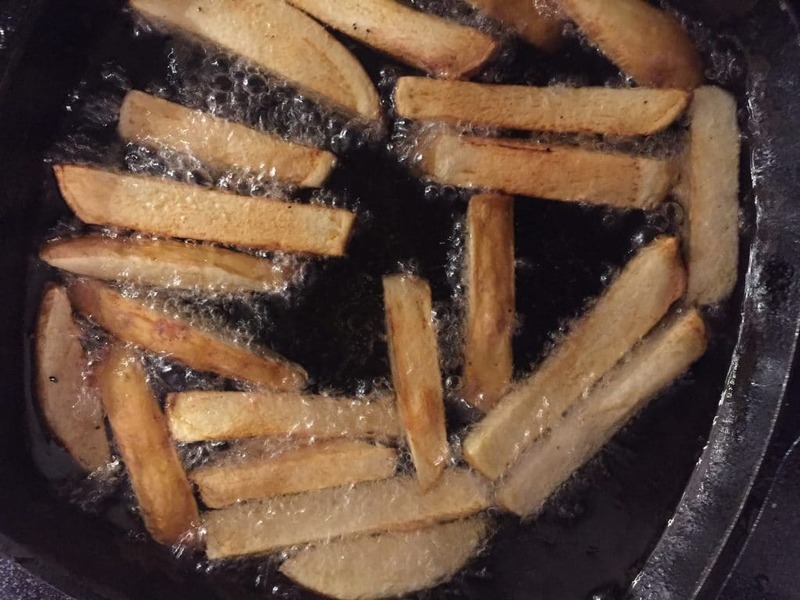 Heat vegetable oil in a cast iron skillet, enough so the fries are fully submerged in the oil for cooking. Fry in batches until golden brown. Be careful not to overcrowd the skillet. 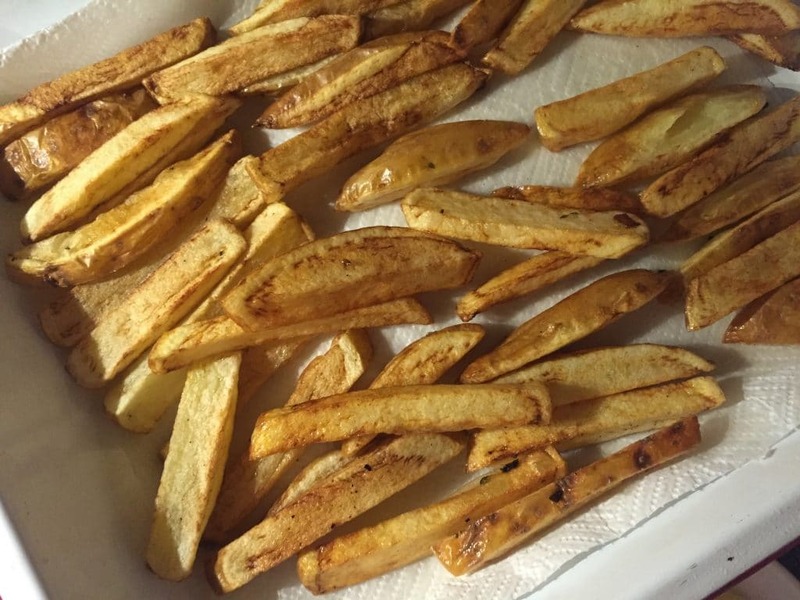 Place a portion of fries on an oven-proof plate or in a shallow oven-proof bowl. Put a handful of Daiya vegan mozzarella cheese over the hot french fries. Put the plate in the oven at 250 degrees for ten minutes to soften the cheese. Using a ladle, pour hot gravy over the french fries and melted cheese immediately before serving. Looking for more ideas? Browse all of my recipes since 2011. Is poutine your ultimate comfort food? Perhaps you prefer something sweet? Let me know what you think in the comments below.